Hello my friend..beautiful..gorgeous picture..love it.. and the quote.. magnificent! It is the perfect design! beautiful shot of the details! I always thought that a spider can create a wonderful masterpiece! I find some webs so fascinating.... but, I hate walking into one, esp if I do not know it is there! creepy!!! Thats really neat. Happy WW! Great shot! Thanks for the WW linky! Very cool photo! Is it really a spider web? Amazing! Spider webs are not the easiest to photograph. Saves you time and effort on decorating! I like the contrast and composition in your photo! Beautiful spider web! Thanks for sharing this wonderful picture. Have an absolutely gossamer WW. Thanks to everyone for all the comments! Autena - it's a natural Halloween decoration spun by a real spider! 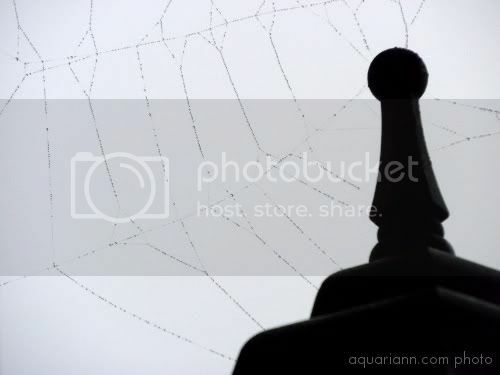 The web shows up so well against the light sky because it's covered in rain drops. Serena - your imagination is better than reality! It's actually the light by my front door. Great picture. I tried to take one last week but my light was not good enough. Lovely image. I hadn't heard that quote before, it's sheer perfection.